Connect with us on social media. Link to Twitter page Link to Facebook in new window. Note: The preceding link leaves NYSDOT trusted sites. What information will I find in the 511NY system? What is the extent of information in the 511NY system? 511NY covers the transportation system and services throughout New York State. Major state highways are covered statewide and major county and local highways are included in the New York City area. Public transportation services throughout the state are featured. Major events occurring on local roads will be described in the 511 system if they have been reported to us. The phone system has nine different menus tailored to the regions shown in the following map,reflecting differences in the availability of services and information needs around the state. The information in the 511NY system comes from many transportation and police agencies in New York and surrounding states. Traffic management centers monitor and provide traffic condition information to the 511NY system. Staffs at these centers receive highway condition information from police and transportation officials, motorist assistance patrol drivers, 911 calls, construction crews, traffic cameras and roadway sensors. Transit information comes from public transportation agencies. Weather conditions, forecast information and alerts are provided by the National Weather Service. How current is the information? Information on traffic or transit conditions, changes all the time. Speed data and camera images are updated continuously. Camera images are updated as quickly as the camera system allows; every 30 seconds in some cases and every 60 seconds or more in other cases. Information on incidents is updated by agency staff as conditions are reported from the scene. Information on road construction and maintenance is updated as new work is started or completed, or as travel conditions change. Winter roadway conditions are updated at least every four hours during winter months and more frequently during storms. Other information, such as construction projects or transit schedule changes, is updated as soon as this information becomes available. Agency contact information changes infrequently. How does 511NY differ from the travel information on the radio and television? 511NY is another information source for travelers that complements radio and TV broadcasts. With 511NY you can expect to receive more detailed, current and route-specific traffic information than is provided in a short, general traffic news slot, and you can get the information whenever you need it. Beyond this, the 511NY system offers a broad range of information on transit service, transit trip planning, carpooling and many other services not covered by the media. The route I will be using passes through New York and another state. Is there a way I can get information easily on both? For the metropolitan New York City area, 511NY also will provide information about northern New Jersey and southwestern Connecticut. Statewide 511 services are provided in New Jersey and Vermont; Quebec has a 511 service throughout its province. 511NY users will be able to transfer directly to these services from 511NY. Other states may be contacted by phone or Web site. How will 511 differ from 911 and 311 phone services? 311 Local Government Services Non-emergency police and other government services. Available in NYC, Rochester and Buffalo. 511 Travel and Transportation Free. Available in many states. Incidents disrupt the normal flow of traffic or transit services, including accidents, vehicle breakdowns and road debris. In extreme cases, incidents may require a roadway to be closed. Can there be delays without an incident? Delays also can occur because of special events, construction advisories, bad weather conditions or high traffic volume. What if I want to know about an alternate route to avoid an incident reported on 511NY? How can I get this information from 511NY? Ask the 511NY phone system about conditions on the alternate route you are considering, or view the roadways for closures, incidents, construction and current traffic speeds. Why aren’t there cameras, message signs and speed information available on all roadways? Cameras, signs and sensors are installed along roads with the most traffic; primarily on major routes like interstates and state-maintained highways. Traffic patterns are reviewed periodically to determine where additional equipment should be installed. Why are electronic message signs blank most of the time? These signs are blank when conditions are normal and are used only when there is a problem, such as an accident, disabled vehicle, construction, road closure or another condition. What are the scrolling alerts on the 511NY Web site? The alerts are warnings or information about major incidents affecting the transportation system in the state. To get alerts for a specific region, select the region from the Region drop-down list located on the top right. How do scrolling alerts differ from TransAlerts and closures? The scrolling alerts are Closures or Incidents in the events list that have been rated extreme or severe and do not appear as a separate category. Our TransAlert notification service draws on the same pool of incidents and closures. While the scrolling alerts only show the most significant events, the TransAlert service lets you pick the event severity level, including events that are moderately disruptive. If I select My Customized Alerts, what information can I customize? Select My Customized Alerts to the right of the scrolling banner to limit the alerts reported to just one of the regions displayed in the drop-down list. If I do not choose to select My Customized Alerts, what information is displayed? Unless you choose one region in My Customized Alerts all alerts in the state that are in effect will be shown. Is there a way I can get notified when an alert occurs? Yes! Sign up as a TransAlert subscriber to get information about major incidents affecting transportation in regions or routes you specify. You will receive short e-mail cell or cell phone text messages in near real time with information about an incident's location, nature, severity and other important information. Alerts will be updated during the course of an incident, as necessary. TransAlerts are issued only for the most serious and unexpected events that have a high degree of impact on travel. This can include incidents on highway, rail or aviation systems. For further information, visit our TransAlert FAQs. To subscribe, visit NY-ALERT Subscribe. This is an early-warning system to help find abducted children. AMBER stands for America's Missing: Broadcast Emergency Response. This is a cooperative program among law enforcement, broadcasters, transportation agencies and others to immediately involve the public, especially motorists, in the search for an abducted child. If you witness a child abduction, contact your local law enforcement agency or 911 to report it quickly. Note important information, such as the physical characteristics of the child and suspect; the make and model of any vehicles involved (including license plate numbers if possible); and the precise location of the abduction. What are the laws in New York State about accessing text messages while driving? Effective November 1, 2009, the use of portable electronic devices by drivers of motor vehicles is prohibited. If you use a portable electronic device (such as a mobile telephone, smart phone, Blackberry or iPhone) to send or receive text messages or e-mails, you may receive a traffic ticket and pay a fine of $150. Please remember to drive responsibly. If you need to use your device to access 511NY en route, pull off to a safe area such as a rest area, fueling station or other stopping point, or have a passenger access the information for you. Remember, it is illegal to park your vehicle on the shoulder of an interstate highway unless there is an emergency. Please visit the New York State Governor's Traffic Safety Committee page for more information. Is there a 511NY mobile web service? The 511NY website is developed to be responsive and provides an optimal viewing experience across all devices including PC, tablets and smartphones. Users can browse to http://511ny.org from any device to have access to the complete set of features on 511NY. What is 511NY Mobile Web? The 511NY Mobile Web offers up to the minute real-time information on traffic, transit and travel conditions. The mobile web can be accessed from a browser on your iPhone, Google Android, or other smart phone device. The mobile web provides traffic & transit information as well as a trip planner. Incident, construction, special event and speed information is also viewable. Users can access cameras, weather forecasts & alerts, and get travel times for bridges and tunnels. Is there a cost to access the Mobile Web? The service is a free. However, the cost to access this information is dependent on the Internet/ data plan you have with your mobile service provider -- typically a monthly access fee. Is there a 511NY mobile app? What devices can I use the 511NY Mobile Application on? 511NY currently provides the application on the Blackberry, iPhone, and Android devices. Please remember, NYS Law prohibits using mobile devices while operating a motor vehicle. When using electronic devices while traveling, remember to drive responsibly and know before you go! Have a passenger check the information for you or pull off to a safe place, like a rest area, before using those devices. What are the requirements for use on my device? Where can I find the 511NY app? The iPhone and iPod Touch application is available through iTunes. The Android application is available through Google Play. Is there a charge to access this application? No, the 511NY app is a free service of the New York State Department of Transportation. My 511NY is a free, personalized service on the phone, mobile apps, and web that allows you to customize 511NY, your way. With MY 511NY, you build your own 511NY.org home page or bypass phone menu options to go directly to your information. During registration, you define and save up to six traffic trips, with names like "Home to Work" or "Work to Gym", six transit trips, and identify up to six CCTV traffic cameras you check most often. You can also sign up for up to six driving time trips for Long Island. Then you can access incident information for those trips on the 511NY phone service 511NY.org and the 511NY Mobile Apps. Click here for more My 511NY FAQs. When can I call the 511NY system? The 511 phone service is available 24 hours a day, seven days a week. How much does it cost to make a 511NY call? 511NY does not charge for the call. Calling 511NY from a landline phone will cost the same as making a local call. If you use a cell phone, airtime and roaming charges may apply. Will I be able to call 511NY anywhere in the state? 511NY is available all across New York State. Telephone service providers will need to establish the ability to route 511NY calls to the system. Contact your telephone company if you are unable to reach the 511NY service. How does the phone system know the location from which I am calling? The New York 511 phone system will either identify your telephone prefix when you use a landline phone or the communications tower that your wireless phone is connected to when you call. Knowing your calling location allows the 511NY system to provide information specific to that area of the state. What languages does the 511NY system use? Information in the 511NY phone system and Web site is presented in English. Will my call be dropped if it can not be transferred to another system? No, the New York 511 service will keep you on the line until your call is successfully transferred to a partner agency when you select this option. Can I use my Internet phone (Voice Over IP/VoIP) to call 511NY? This depends on whether your provider offers an address translation service (primarily used to identify your location for 911 or E911). If so, when you call 511NY your call will be routed to the 511NY system if your registered address is in New York State. The following VoIP carriers provide this address translation service: AT&T Wireless, AT&T Wireline, Frontier Communications, OneCommunications, Sprint (Including Nextel), T-Mobile, Verizon Wireless, Verizon Wireline. Can I call the 511NY service using a cell phone while I’m driving? Use of a hand-held mobile telephone while driving is prohibited by New York State Law. If you use a hand-held mobile telephone while you drive, except to call 911 or to contact medical, fire or police personnel about an emergency, you may receive a traffic ticket and pay a maximum fine of $100 and mandatory surcharges of $50. Use of a hands-free microphone is all right but put safety first. Call 511NY before you leave. If you do need to call 511NY en route, call from a rest area, fueling station or other stopping point, or have a passenger make the call for you. Remember, it is illegal to park your vehicle on the shoulder of an interstate highway unless there is an emergency. Does 511NY have an 800 number option? What if the system is busy when I call? With 511NY, your call will always be answered. If there is an unusually high volume of calls when you called, your call will be put in a queue to interact with the system. We are monitoring call volumes and will add capacity if needed. Why can’t I reach 511NY? Your telephone company doesn’t provide access to 511NY. Most landline and cellular service carriers in New York State allow access to the 511 system. If your carrier is not listed, ask it to support 511NY. If your carrier does not support 511NY, you can reach 511NY via our toll-free number: 888-GO511NY (888-465-1169). Cell phone reception is poor. Try calling back from another location. Your phone system at work does not support dialing 511NY. Many businesses have their own telephone systems that may need to be reprogrammed to allow direct access to the 511NY system. Contact your office manager or telephone system administrator to have them enable access to 511NY. Your cell phone is using a cell tower in a neighboring state. When you call from an area near a bordering state, your cell phone may use a cell tower in that state, not in New York, preventing you from accessing 511NY. This has occurred in some places on the north shore of Long Island (calls may use cell towers in Connecticut). If this happens, dial our toll-free number, 888-GO511NY (888-465-1169). You are calling from another state. Dialing 511 will connect you with the 511 system in the state from which you are calling, if available. Call the 511NY toll-free number 888-GO511NY (888-465-1169). You are calling from a pay phone that has not been programmed for 511. Call the 511NY toll-free number 888-GO511NY (888-465-1169). How can I reach New York’s 511 service from outside the state? How can I connect to other 511 telephone services? 511NY will transfer your call to travel information services in New Jersey, Quebec or Vermont depending on the 511NY calling region menu you are using (the 511NY region must be adjacent to the state or province). If transfers are enabled, say "Other 511 Systems" at the Main Menu. What do I do when the system do not understand what I am saying? there is background noise, such as a radio or people talking near you, that prevents the system from understanding you. Reduce background noise and speak as clearly as possible in a normal tone of voice. If you are using a cell phone and you have a low signal, try calling back when you get a better one. If you still have problems, use numeric touch-tone commands. How do I use the phone system if I am hearing-impaired? Hearing-impaired callers can dial 711 or visit http://www.i711/com for assistance on-line to access 511NY information. 711 is the national three-digit number for access to Telecommunication Relay Services (TRS). Callers dial 711 and ask the operator to connect them to the 511 service. Once connected, the 711 operator acts as a go-between, relaying callers' request for travel information to the 511 system and then providing system responses back to the callers. How do I use the phone system if I am speech-impaired? Speech-impaired callers can use the touch-tone system to access information from the 511 system. Press "0" at each new menu to hear the touch-tone options, then press the number that matches your choice. Once you learn the touch-tones, there is no need to press zero to hear the list of choices; just enter your selection. How accessible is the 511NY Web site if I am vision-impaired? The 511NY Web site has been designed to meet the accessibility policies of the NYS Office for Technology. Most of the material on the Web site will be in HTML or ASCII (plain text) formats. However, some of the files may require users to have installed the following specific software or plug-ins to interpret the page content: Adobe Acrobat Portable Document Format (PDF), Adobe Flash and Microsoft Office. Can I speak to an operator to get information? The 511NY phone service is an automated, interactive voice system driven by the user's voice or phone keys. Voice recordings will give the latest computerized information. There are options to transfer to a specific transportation agency for additional information not offered directly through the 511NY phone system. Say, "Help" or "What are my choices?" at any time to hear your options for the current menu. To return to a previous menu, say, "Go back." To start over, say "Main Menu." How can I navigate through the system to get the information I need more quickly? Once you know what questions will be asked, you can answer them as soon as the system starts asking them. You do not need to wait until the end of a question before answering. Shortcuts are voice commands that bypass a menu and take you directly to your choice. What are my choices? 0 Lists of all choices for the current menu. Main Menu * States Main Menu options. Repeat NA Repeats the last question or list of choices. Go Back NA Halts the system from listing menu options and goes back to the previous menu. Goodbye NA Ends the call. Just press "0" at each menu to hear menu choices and touch tone codes. The nine 511NY calling regions have some differences in their phone system menus. Traffic 1 Get information about closures and major incidents on the facilities you select. Public Transportation 2 Link to a public transportation service or learn about current transit incidents. Paratransit 3 Connect to a service provider. Ride share 4 Connect to a ride-sharing service. Airports 5 Connect to an airport or airport access service. Other 511 Systems Depends Choose another neighboring 511 system. (Downstate Regions) 9 Link to one of the 13 customer support services provided by the MTA. Option not available 77 Give us your feedback. How can I stop receiving calls from 511? If you receive a call that seems to be from New York State’s travel information service because the telephone number begins with "511" on your caller ID, be assured that it is not from 511NY. 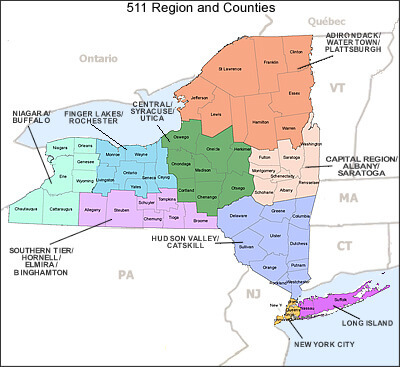 511 is not a valid area code in the US or Canada, and 511NY does not make out-going calls to the public. If you are receiving calls like this, you should contact your telephone service provider and request they block "calls from 511" to you. Be prepared to give your provider the complete telephone number you want blocked. If you have tried to work through your telephone service provider to eliminate such calls and were unsuccessful, please call 511 and use the touchtone keys to press 77 to leave a comment (and remember to hit # when you are finished), or visit the 511NY.org website, click "contact us" to reach us. Please provide your contact information and a message about the problem you are having, and a staff member will reach out to you to help resolve the problem. NYSDOT staff members will return calls only in response to comments left via the 511NY telephone or web service, and a ten digit phone number beginning with a valid area code will appear on your caller ID. What kinds of information can I get about public transportation in New York from the 511NY phone system and Web site? With 511NY you can find out about services within your area of interest. The phone system will transfer your call to an operator if you would like. How does the 511NY Transit Trip Planner differ from others? I’m not sure of exact street addresses. Can I still use the Transit Trip Planner? Absolutely. The Transit Trip Planner uses Google Auto-Complete to help you identify the correct address. You can also click on the map to indicate the approximate origin and destination of your trip. Zoom in, as needed, to see more street detail. What information will the Trip Planner give me? Click on Print Itinerary at the bottom to get a printer-friendly version of the instructions. I’m unfamiliar with the area. Will the Transit Trip Planner show me where the closest stop is and tell me how to get there? Yes. When viewing your itinerary click on the walking map icon on the right side of the screen. Another window will open a map window showing the starting point of your trip and where you will pick up the service as well as proving you with detailed directions. Print the map and directions to carry with you. How are park-and-ride lot locations used by the Transit Trip Planner? If you have toggled the Consider Park-N-Rides in Itinerary option at the bottom of the origin block, after you click on Plan Your Trip a list of the nearest park and ride lots will be displayed. If you click on a button to the left of a lot name, you will see the lot name, location and web site link on the map, and a table below with detailed information on the lot. Lot web pages offer even more information. Click on Driving Directions to see how to get to the lot from your starting point. After you have considered your options, select a lot for your itinerary by clicking on the Use as Origin box. Your detailed itinerary will display next. Which public transportation agencies are included in 511NY? 511NY provides you with access to more than 50 public transportation operators around the state. To select an operator from the phone system, say "Public Transportation" at the Main Menu, then narrow your choices from there. On the Web, select (Travel Links) from the home page, then (Public Transportation). An interactive map then will let you choose a specific area and type of service for a customized list of operators. Which paratransit agencies are included in 511NY? More than 110 paratransit agencies are included. To select an operator from the phone system, say "Paratransit" at the Main Menu, then narrow your choices from there. On the 511NY Web site, select (Travel Links)from the home page, then (Public Transportation) and (Paratransit). An interactive map then will let you choose a specific area (region or county) for a tailored list of operating agencies. What if I don't know which paratransit agency I need? From the Public Transportation menu (accessed by saying, "Public Transportation" from the Main Menu or the Public Transportation menu) and say "Paratransit". The system will respond with a list of service providers. If you would like, your call can be transferred to one of these operators for more information. Select Travel Links > Public Transportation > Paratransit. You will be linked to our interactive application that will allow you to get a list of service providers and their contact information for the area you select. How do I prevent being transferred to an agency that I don’t want? After you tell the 511NY phone system which agency you want, it will confirm your request by repeating the agency's name. If you select an agency and the system reads back a different name, right away say "Stop," "Go Back" or Press 1 to stop the transfer and choose again. If you did not catch this in time, call back and try again. What do I do when I need public transportation information after hours? If you need information to plan a trip, then visit our groundbreaking, multiagency transit Trip Planner Web site. The trip planner will help you map out your itinerary, door to door. Otherwise, call back during normal workday hours. Who do I call to report an incident on a highway? As with all emergencies, if you see an accident or a road hazard, such as a downed tree, flooding or debris in the road, dial 911. Report the location and direction (note the nearest highway mile marker, if you can). How can you make the 511NY system better? The easiest way is to simply use it. The more you use the system, the more we learn about what is important to you. If you have a specific suggestion about how we can improve, tell us using our feedback form or leave a message using the 511NY phone system. Press "77" at any time and you will be prompted to leave a recorded message. We also will conduct periodic phone and Web surveys to get feedback. Can I use 511NY from any computer? Yes. Any computer that has access to the Internet, a compatible browser and security settings to allow cookies will be able to use the 511NY Web site. What types of other electronic devices are supported? Travel and transportation information is accessible using Web-enabled phones and PDAs (personal digital assistants). Other hand-held, mobile and in-vehicle electronic devices eventually will be supported. For further information, refer to the section on accessing 511NY via mobile devices. What Web browsers work with 511NY? 511NY has been tested with Internet Explorer 6.0 and above, and Firefox 2.0 and above. Other browsers also may work. What are cookies and why are they used by 511NY? Cookies are a small amount of data sent to your Web browser from a web server and stored on your computer. They are only used to save your latest map view which can save you navigation time when you visit 511NY.org the next time. The cookies used by our 511NY system do not contain any personal information about you and the information in them cannot be accessed by other Web sites. I'm a dial-up user. Can I still use the 511NY traffic and transit condition maps? Select only one or a limited number of information categories. The more you pick, the longer it will take to display all icons on the map. Stick with the Google Map view (instead of Satellite or Hybrid). Do not view camera images (these take the longest time to load). Internet Explorer 9 and higher, latest versions of Firefox/Chrome/Safari. What information is shown on the Traffic and Transit Conditions Map? Click on the weather icon to get the National Weather Service forecast for the next seven days. This will display for 13 different forecast zones around New York State. Click on the alert icon to see the latest weather alert issued by the NWS (if an alert is in effect) and time the alert was issued or updated. An incident describes something that disrupts traffic or transit flow, traffic, such as an accident, vehicle breakdown or road debris. Move your mouse over the icon to display the location of an incident. Click on the icon for detailed information including the time of the last update. Special Events are planned activities such as concerts, bicycle races, festivals, fairs, etc. that impact traffic. Advisory messages present the name of the event, date, time, location and traffic impacts. Mouse-over an icon to see the name of the bridge or tunnel. Click on an icon to show the current river crossing times by direction of travel. Icons show active traffic and transit construction projects. Mouse-over an icon for information on project location. Click on it to learn more about traffic impacts, timing and duration. View pictures of current traffic conditions from the location chosen. Mouse-over a camera icon for a description of the camera’s location. Click on it to display the camera image, location, operating agency logo and camera direction. Select Speeds to see the average speed of traffic at roadside traffic detectors locations. Colored dots show detector locations and speed range of traffic. Mouse-over a dot to get information on location, traffic level, average traffic speed and time of the last update. Mouse-over a message sign to get its location, message content, and time of the last update. View information on rest areas and travel plazas across the state. Get information on location, hours of operation and facilities. View information on truck height and load limits for various roadways. View information on closure due to incident for various roadways. View information on closure due to construction for various roadways. View information on closure due to special event for various roadways. How do I change the area shown on the Traffic Conditions map? Pegman - Drag the yellow pegman to any road to enable street view. Zoom - Click + to zoom in on the center of the map. Click - to zoom out. How long does it take for an accident icon to appear on the map? After an accident has been entered into the system, it is immediately available to the public. Why doesn’t an accident I saw appear on the map? All major accidents and other events reported to us that occur on the state highway system will be included in the 511NY system; however, there may be some delay getting accurate information from transportation employees or other first responders at the incident scene. Accidents that may not cause major disruption may not be included, particularly if they occur on local roads. The information on a 511NY Web page I viewed looks dated. Why? To see the latest information on the 511NY Web site, make sure your Web browser is set to refresh pages automatically so it checks for newer versions of stored Web pages. Otherwise, the version of a page stored on your hard drive from your last visit will be loaded. Also, during a session select Refresh or Reload from your browser's menu or press the appropriate toolbar icon. How do I make icons display faster? To improve performance, select only the information categories you really want. The more legend items you select, the longer it will take to display icons on the map. You also can speed up the rate of information delivery by sticking with the Google Map view (instead of Satellite or Hybrid). This is particularly true if you are going to pan the map (move location). Where can I find information about winter road conditions? Road condition information is available from the 511NY Web site. Select Traffic/Transit, then Traffic/Transit Map from the main menu, then select Winter Road Conditions from the map legend on the right. Our Winter Road Conditions system describes driving conditions on many of New York State's most-traveled roads. Conditions are displayed on a zoomable, color-coded map based on snowplow drivers’ reports. Conditions are updated at least every four hours during winter months and more frequently during storms. See the Status Definitions page for terms used and their explanations. How do I use the 511NY Transit Trip Planner? Enter your Start and End Address in the fields shown to the left of the map. Then click ‘Submit’. If you want to add more settings click the ‘Show Settings’ button. There you will be able to enter whether you want to ‘Arrive at’ or ‘Depart by’ a certain time and date, which can be filled in manually or using the clock and calendar pop-ups. Absolutely. The Transit Trip Planner uses auto-complete functionality to help you identify the correct address. You can also click on the map to indicate the approximate origin and destination of your trip. Zoom in, as needed, to see more street detail. Yes. Your itinerary will be displayed alongside a map showing the starting point of your trip and where you will pick up the service as well as providing you with detailed directions. Yes, the Transit Trip Planner supports printing. After you have planned your journey and selected your trip option, click the print icon on the right side of the option summary (under the total travel time). Your browser should open a pop-up window to allow you to choose your printer and other printing options. The Transit Trip Planner can’t find my address. Zoom into your address and right click on the map. The map will give you an option to set your start location or end location.